Brought to you by the creator of Carcassonne, here's a tribute to that fateful event in 79 A.D. that has players frantically positioning and evacuating as many citizens as possible from the wrath of Mount Vesuvius. Trivia: In my copy of the game I only received 25 Blue pieces and 28 Yellow pieces (where the instruction manual said that I was supposed to have 30 of each colour). I emailed Mayfair games to get the missing 5 Blue and 2 Yellow pieces. In previous editions of the game you apparently were forced to pick certain colours depending on the number of players you had as not all colours had the same number of pieces (which, if true, is ridiculous). Price Range (AUD): $41 to $80 (with one shop even selling it for $107 inclusive of shipping). Availability: Quite widely available online and I would imagine many hobby stores should stock this. The Downfall of Pompeii is one of those rare games that properly acknowledges and tributes a particular moment in history - both in terms of its gameplay, feel and artwork. Players aim to place as many citizens in the city (preferably close to the city's exits and on the same squares/buildings as other citizens) during the first two phases of the game. Then, in phase 3, Mount Vesuvius erupts and each player must then evacuate as many citizens as possible. Through the drawing of lava tiles, each player gets a say as to how the lava enters the city which makes the game very interesting as the lava can potentially harm any of the player's citizens [see below rules and pictures]. There is therefore some degree of strategic thought to this game as you try to amass your citizens in the right areas, whilst keeping an eye out on what your opponents are doing. You are constantly checking to see if any one player is doing too well, and there will be opportunities to 'keep the playing field even' by throwing their civilians into the volcano (through the Omen cards) or threatening their citizens with lava tiles in phase 3. However, cunning players can hedge their risk by placing their citizens alongside their opponent's citizens in the same square - thus reducing the incentive of a lava attack by that opponent on that square because 'If you attack me that will bring you down with me too". Overall this is a gem of a game and, minus a couple of annoying things I outline below (relating mainly to the setting up of the game) I'd highly recommend it to anyone. Great artwork and theme. Love the plastic volcano provided as it adds real depth to the game. Gameplay is fantastic and fits the theme of the historical event well. Interesting mechanic of evacuating citizens through the multiple city gates. The third phase of the game is excellent as it is the ultimate culmination whereby all citizens try to flee the burning lava. All that matters is that as many of your citizens as possible escape the ensuing destruction. The different phases of the game are interesting too and build up the flavour of the game. Considerable strategy - the idea is to hoard as many citizens in the same area (as this increases movement options) whilst balancing this with ensuring that your citizens are within close proximity of the city gates (and far away from the potential lava hotspots). Setting up the deck is a pain - it can be annoying and time consuming to follow the instructions as the deck is configured differently depending on the number of people playing AND you need to ensure that the 3 phases of the game are properly incorporated into the deck. Obviously luck-driven as cards are involved. 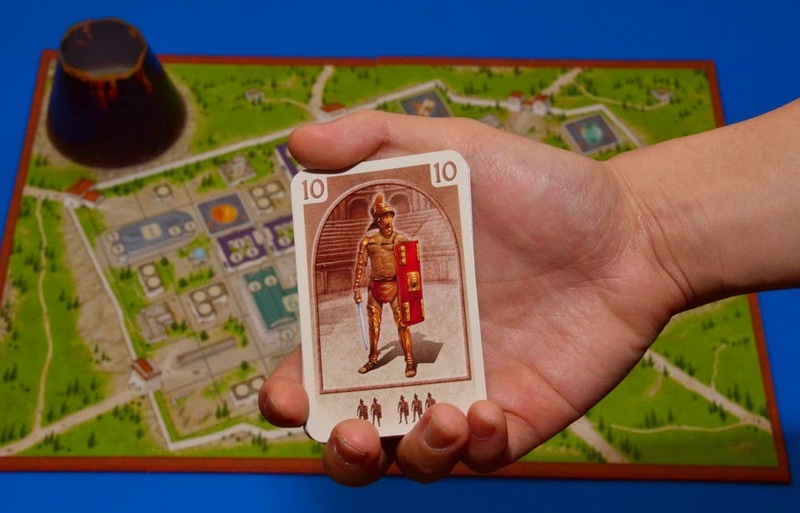 If you want to relive the downfall of Pompeii, then you should give this game a go. At the outset I should tell you that the aim of this game is to evacuate as many citizens as possible from Pompeii. This involves, firstly, placing citizens in the city and secondly, evacuating them when it hits 79 A.D. The deck needs to be configured in a certain way - which I won't go into as it is a bit annoying to explain. The board looks like this, which is really cool especially with the 3D volcano. The artwork is particularly nice. Give each player all 30 circular pieces (citizens) of a colour of their choice. There are 3 phases in this game, all of which have been configured into the deck at setup. 3) Then draw a card. For example suppose that Black plays the Brown 10 card. Black can place her citizen in any of the 5 positions (circles) in the Brown 10 building [the bottom of the card shows that the Brown 10 building is split up into 2 sections: one with 2 positions and one with 3 positions - this is important for the purposes of the "Relatives" rule in Phase 2]. The second phase of the game occurs after 8 cards have been drawn and the first A.D. 79 card is drawn. In this phase, play continues as it did in the first phase as stated above. 1) "Relatives": This is a strange rule name. If a building is already filled with citizens of any colour (not necessarily your own), if you place your citizen in that building, as a bonus you get to add X more citizens to buildings of the same colour OR a neutral (beige) building where X is the number of citizens in that building part before you placed your citizen. 2) Omens: Omen cards will now appear as they have already been shuffled into this portion of the deck at the start of the game. When you draw an omen card you get to choose any opponent's citizen and throw them into the volcano. Then you draw a replacement card. For example, Black draws an Omen card. Seeing that Yellow is her nearest competitor, she chucks the Yellow citizen from Pale Grey 8 into the volcano. Third Phase - Mass Evacuation! When the 2nd A.D. 79 card gets drawn all cards get put away as they no longer matter. From now on, lava tiles are drawn and everyone's citizens will attempt to escape to outside the city gates!! Shuffle all the lava tiles and place them in the bag provided by the game. Now each player, one at a time, draws one tile from the bag and places it on the board according to the symbol found on the lava tile and on the board (see below). This happens until 6 lava tiles are on the board. Lava ties must be placed orthogonally adjacent to other lava tiles of the matching symbol (ie. not diagonally and they must be touching another lava tile of the same symbol). If a lava tile is placed on a group of citizens, they all get thrown down the volcano!! Note that in the bottom left corner of the picture above there is a blue mask symbol (which is another symbol for the lava tiles); whilst the right side has a bronze helmet symbol. Then 4 more tiles are drawn and this is what eventuates. Player B draws the 6th tile and decides to place it in the below position to destroy the Yellow and Black citizens. They get thrown into the volcano. 2) Then moves up to two of their citizens. The number of movements each piece can make is equivalent to how many citizens are occupying the same square inclusive of that citizen being moved (which is a maximum of 4). Exceptions: If the piece is either your only citizen left in the city OR is a lone piece that is by itself in a given square in the city - a player can opt to move that piece two squares (instead of moving two separate citizens in the latter exception). Suppose this is the current situation and it is Black's turn. Black wants to move her citizen from that group of 4 on the very left. Whoever has the most number of citizens evacuated wins. Should there be a tie, the person who has the least citizens in the volcano wins.